Samuel Beckett‘s Waiting for Godot is generally ranked as one of the great literary and theatrical masterpieces of the 20th century. Most theatregoers will have heard of this play, most English majors will have read it, and most theatre majors will have performed scenes from it. Philosophy majors will recognize it as one of the greatest modern examples of philosophically inspired literature. Clowns and comic actors will aspire to it as the pinnacle of their craft. Audiences who attend the current production by Tides Theatre at the San Francisco Playhouse are likely to be similarly disoriented. The play can be approached as a collection of wildly funny music hall routines comprising comic business with a pinched shoe, hunger for carrots, juggling hats, some silliness about the difficulties of hanging oneself from a tree, fart jokes, and so on. In short, the fullest range of low humor ala The Three Stooges or Laurel and Hardy. In that approach, the play has been a showcase for the comic genius of the legendary Bert Lahr and, more recently, Robin Williams and Steve Martin. One can easily imagine the likes of Red Skelton or Bob Hope, perhaps Eddie Murphy or Jerry Lewis having a comic heyday with this material. In such an approach, the serious philosophical underpinnings of the text are never explicitly in evidence. One laughs all the way to Armageddon. (from l to r) Keith Burkland as Vladimir and Jack Halton as Estragon in Tides Theatre production of Samuel Beckett's "Waiting for Godot". Photo Credit: Tides Theatre. Alternatively, the same material may be played as serious drama, every ridiculous sequence treated with the utmost seriousness, creating a peculiar and alienating effect, disconcerting and fascinating. In this approach, the seriousness of the themes is never far from the surface. Productions of both types have their adherents, but my personal preference is for the low comedy, which is what I believe Beckett intended. Director Jennifer Welch has chosen the dramatic approach. Keith Burkland (Vladimir) and Jack Halston (Estragon) are excellent naturalistic actors and they are convincing as the two tramps. The music hall material is played as straight forward drama that is really happening and it is believable and interesting. Alas, it is not particularly entertaining or funny. For those with a philosophical bent of mind and the patience to follow complex ideas presented indirectly by means of implication, this may prove to be a fascinating evening. Certainly, students of Beckett who know the play only on the page will be pleased to experience it in performance. For my taste, however, this production takes the wrong tack and I would not recommend it for theatregoers who are not already thoroughly familiar with the piece. This is not to say that there isn’t some excellent work, particularly a stand out performance by Renzo Ampuero as Lucky. 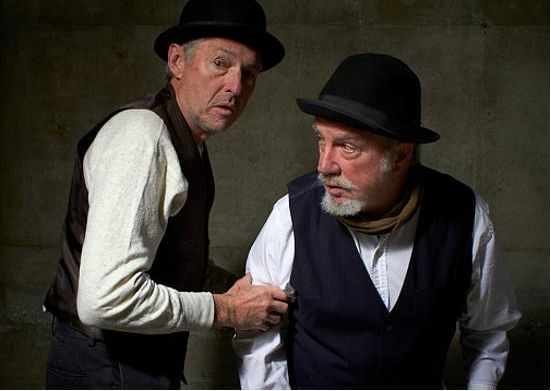 Waiting for Godot continues at the San Francisco Playhouse through April 14th. For further information click here. “Waiting for Godot” by Samuel Beckett, produced by Tides Theatre. Director: Jennifer Welch. Assistant Director: Cary Cronholm Rose. Soundscape: Jon Bernson. Set Design: Richard Colman. Estragon: Jack Halton. Vladimir: Keith Burkland. Lucky: Renzo Ampuero. Pozzo: Duane Lawrence. Boy: Caleb Alexander. Posted in Reviews.Tagged Caleb Alexander, Cary Cronholm Rose, Duane Lawrence, Jack Halton, Jennifer Welch, Jon Bernson, Keith Burkland, Renzo Ampuero, Richard Colman, Samuel Beckett, San Francisco Playhouse, Tides Theatre, Waiting for Godot.